I have noticed that every time I get the hands on someones save game a lot of ideas starts to pop into my head. Right now I am looking for someone that have a big dungeon they want to share with me. If this person is having troubles with the production chain in the dungeon it is even better. When I play the game myself I play it in a way that I think is the most efficient according to the way I have programmed it. But this limits my horizon quite a bit. By trying out other people savegames I have found issues that I didn't thought were there. So if someone sends me their savegame, I will make it my goal to make the game compatible with his or her dungeon layout / building styles. Either by making some parts of the dungeon more efficient or create warning systems when something is really wrong. The savegame folder is in "C Users/[Your name]/AppData/Roaming/Dwelvers/Saves", please note that the "AppData" folder is a hidden folder. It is possible to attach the savegame to the post, but you will have to zip it first. Next, I'll attach an earlier save of the game game that may include the production chain issues. For some reason it wouldn't let me attach the file, claiming I'd reached my attachment quota despite the fact that the file is about 2.9 MB and I should have way more space then that available. Game2a - This is from an earlier point in that dungeon and may have the part where my production chains really got clogged. Game2b - This is the same dungeon as 2a, but is more developed and I think the production chains are starting to recover by this point, which involved a lot of micromanaging using the storage mode tools. Now that is a real efficient dungeon. You took over the maze and put Cyclotaur beds in there?! Thanks again for the savegame SU (+3 to you), now I am able to run the Game2a savegame with the antroot farm at max productivity without building anything or changing anything. One issue was that the number of antroots allowed to be stored in the room were 3, and if there were three antroots or more stored the imps in that room stopped harvesting antroots. Now we have it so that the limit instead is number of antroot farms x2, so 50 antroots can be stored in this case. This is not only applying to antroots, but all items being produced. The other issue was that only 3 water buckets is allowed to be stored in the farm at once, meaning that there are no buffer filling up while the antroots grow. This limit has also increased in relations to the number of buildings that needs water. So now while the 25 antroots are growing the imps will collect 25 buckets of water in the room and have them ready for use when it is time to water them again. The third issue was the water production, the number of water buckets allowed in the whole production chain was calculated from 3x the number of storage rooms, I thought I had the demand of water included in this, but because of a programming error this wasn't included. So now if you have 25 antroot farms and 5 storage rooms the maximum number of water buckets allowes in the dungeon is calculated from "(Demand x2) + (StorageRoom x3)" -> "(25 * 2) + (5 * 3)" = 65 water buckets. So there will be no more water shortage! This included with workers being auto assigned to the rooms if they are needed really got the production going. Right now I am adding a percentage value in the room info window where the player can see the work-load for the imps working in that room, this will help the player see if there are a need for more imps in a certain room. In your savegame I could actually reduce the number of imps in the farm room from 5 to 2, and the number of workers in the cookery room from 4 to 1. I did increase the number of workers in the Dark Mother room to 6, because there were a lot of production rooms connected to it. Also I had to reroute some of the items that could clog up the dark mother storage room in the future. That's awesome, glad I could help. +2 for figuring out solutions to so many production related problems. Have mine. It's a lot of fun to see creatures suffering and killing each other because of hunger caused by... WOOD SHORTAGE! I haven't had such fun in a long time. Here's my first dungeon on hard difficulty. A lot of fun and a lot of fish! How was it? Was the hard part the beginning and then it got easier? How did you play it to manage the first waves? (22-09-2014, 03:41 PM)Rasmus Wrote: How was it? Was the hard part the beginning and then it got easier? How did you play it to manage the first waves? No the game was a challenge all along. Firstly, I had to modify my build order. On normal difficulty I have plenty of time to plan my dungeon. My imps could slowly dig everything, collect resources and so on. 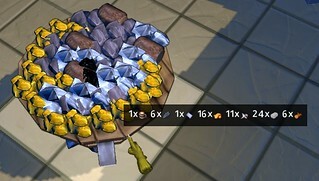 While playing on hard I can't do that, since imps aren't gathering currently imporant stuff, but literally everything like wood, stone, coal and they are delivering them to DM room, or Storage room. From those stockpiles they are taking resources to construction site, but I don't have time for that. So I just dig small rooms and build 2x1 Storage room and 3x3 bar room, then I build tables in order to start orc production. (Offtopic) I must admit that I don't like current Job Assignment System(? ), or Job Priority System(?). Eg: at the beginning I don't need coal, but I need wood for my bar room. So I'd like imps to pick wood firstly, then deliver it directly to construction site of bar room, not to DM room. It would made life so much easier. First wave with three, or four orcs is relatively easy as long as you are quick enough to seal the tunnel before imps even consider claiming area which leads to portal - you don't want Pandora's box containing 2x7lvl human warriors to be opened. After that game slows. You just hunt single fishman, train your troops, take control over small Impanzee's rooms, start production of Bent swords. I also had to deal with wood crisis. I find Maze really difficult. I had to learn how to use Hydraulics, but even with canons I had problems with lvl 7 Cyclotaurs. After claiming Maze some bigger Impanzee's room, or 2-3portal next to each other still were problematic. It really deserves to be called hard difficulty. (22-09-2014, 05:38 PM)Ardilor Wrote: While playing on hard I can't do that, since imps aren't gathering currently imporant stuff, but literally everything like wood, stone, coal and they are delivering them to DM room, or Storage room. From those stockpiles they are taking resources to construction site, but I don't have time for that. So I just dig small rooms and build 2x1 Storage room and 3x3 bar room, then I build tables in order to start orc production. (for example starting at 2:40, he started to play on hard level too) where roots were dug out, but Imps instead of getting laying wood on the floor directly to new Farm Room construction site just put everything and first to Dark Mother storages. Actually in next video (2nd try, see 7:35 and later 29:26) there are some AI issues with attacking, they just walk, if you find this as an issue Rasmus I'll move this to Bugs/Issues & Crashes forum. Note: I am still learning how the chain link system works, so I don't know if I am doing something incorrect or not. My concern is the production being linked to storage that is linked to DM. Is the production suppose to draw from storage and/or DM or is it suppose to draw from DM only. In my case linking to DM directly seems to work fine, but when I am linking to storage is where in lies the problem. Once storage fills to 100% production just stops, even though that storage is also linked to DM. I did have my farms connected to the storage in question. The cookery is what is still linked to that specific storage. It has toned down a bit to 99% after I connected the farms directly to DM, but the cookery refuses at the moment to function. The storage has plenty of resources to use with the cookery, namely flour & antroot. I know I probably should add more wells per cooking table, however I have run into this same problem before where storage fills to 100% and then production stops with the linked room. It is not really all that big a dungeon, but sizable enough for what I have. This is on normal and the start was more of a rush to defend & ward off enemies from nearby portals then focus on what was needed. That was a thrill, but I managed to pull through eventually, and got what was needed built. If production stops because of a full storage the production is connected to, wouldn't it make sense that they would draw the needed items from that storage to continue production? or are those chains suppose to be connected directly to DM no matter what? If that latter part is the case then what is the point in having storage linked to production? That is what is confusing for me when making the links between rooms. EDIT: Forgot to mention this was made in the initial steam release version, and was loaded in e version. Oh well, I managed to finish Impossible. Find plenty of bugs through the way, but I'll post them "tomorrow", since I am tired right now. This one is like late early game. Being sieged by 8 portals. This point in game was really tricky, it's very easy to attract thieves, so expanding is difficult. I called it mid-game. The end, after clearing Maze, portals and Impanzees rooms. Current time: 23-04-2019, 02:19 PM Powered By MyBB, © 2002-2019 MyBB Group.